A picture may be worth a thousand words, but two or more pictures combined can tell a story. Diptic, a new app by Peak Systems, lets you combine two or three of your photos to create a new image, making it possible to create photographic series, before-and-after sequences, or other narratives right from your iPhone or iPad. Unlike many photo apps that try to cram in as many features as possible, Diptic keeps things simple and clean. Just select a layout from five available templates, then start adding photos by shooting them on the spot (if you have an iPhone) or picking from your device's camera roll and albums. While arranging photos into a layout, you have the ability to pan, rotate, mirror, and zoom individual photos to tell just the right story. You can adjust brightness, contrast, and color saturation too. When you're satisfied with your “big picture,” you can e-mail a copy or export it to your device's camera roll. And there you have it, folks—a simple, elegant way to use pictures to tell your story. 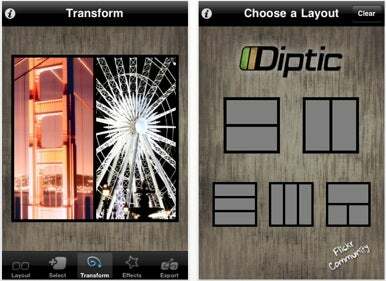 Diptic sells for $2 and runs on iPhone, iPod Touch, or iPad running iOS 3.0 or later.